Speed - One quick swipe o the card logs you in. Security - Nobody knows their password and if they discover it, the onscreen keyboard doesn't have the characters needed to type it. Tight control over supervisor voids and deletes. You know that the Supervisor's or Administrator's card was used and not just a shared password. The card must be encoded on TRACK 2 with a 6 digit number. 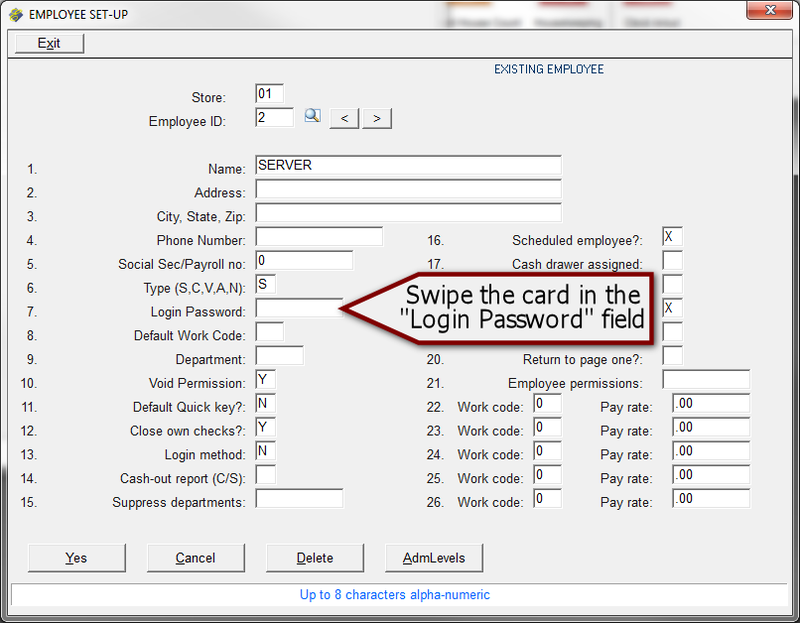 The Start and End sentinel characters inserted by the card swipe will produce the 8 character password. Each terminal must have a credit card swipe for this login method to work. You also need a credit card swipe at the terminal were this will be set up. In the "EMPLOYEE SET-UP" screen in the POS Administrator menu, bring up the employee to be edited. Place your cursor in field # 7, Login Password. Swipe the card in this field. Save the changes and test the card by swiping it at the login keyboard screen.